Reviewer: Sajan Raj Kurup, chairman and chief creative officer, Creativeland Asia Pvt. 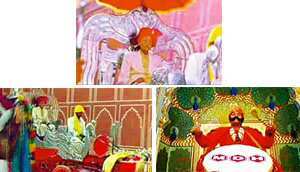 Ltd.
Spot: The latest commercial for Mahashian Di Hatti Ltd, or MDH, shows the entry of the founder, Dharampal Gulati, on a grand chariot. The idea is to essentially associate the brand with all things regal and royal. Why I don’t like it: Commercials for MDH spices usually come with a script which is nothing to talk about. And just when the commercial is about to end, the owner of the company makes a cameo appearance. Earlier, he used to appear in a little inset. These days, it’s full screen. He could strike anytime, anywhere. At a wedding. In restaurants. In a chariot. His media planners do a real good job of making him ultra-visible in the clutter of Shah Rukh Khans and M.S. Dhonis. His writers and film-makers, I’m afraid, do a shameful job. How I would have done it: I see an opportunity to make this man iconic and his commercials really entertaining. Come on, he’s got potential. He’s got something Burger King and Ronald McDonald don’t; he is for real. I would just push the plot. Here are a few plots I would consider. If the plot was fantasy, we could do a “Charlie and his masala factory". If the plot was Burger King, we could have done a “Masala freak out". If nothing else, it would at least create a drama. Like a jack-in-the-box. I would even attempt to build him into a taste-obsessed masala chacha (spice uncle) who is really particular about how food tastes and smells. If your food didn’t taste the best, he would barge into your house and lose his shirt. And that’s just for starters. Don’t write him off—a slight shift in perspective and you could be walking the red carpet for an MDH commercial!